CURRENT USA LOOP IC MARINE PRO BUNDLE WITH 48 ORBIT MARINE IC PRO LED LIGHT. Lighting - FIxtures & Bulbs. 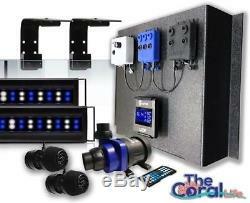 Bundle includes Orbit Marine IC PRO LED lights, adjustable tank mounts, wave pumps & DC flow pump with Wireless 24-hr. Your reef never looked so good. Marine bundles provide everything you need in the lighting and flow department - delivering an amazing reef keeping experience at an incredible value. Control, you can watch clouds gently roll across your reef or crank up the water surges for your anemones all with a single touch. LOOP connects and syncs everything into a single, wirelessly controlled network. So whether your setting up a new softie reef, or just ready for an aquarium overhaul, LOOP Marine bundles make it easier than ever. LED lighting system with full spectrum and dual actinic output, producing strong coral growth and color. Adjustable tank mount arm brackets for a sleek, modern look. Wave pumps create pulsing waves, surging water currents with adjustable flow. DC flow pump provides adjustable strong return water flow. Wireless control system w/new Power Center. IC LED lights produce brilliant, vibrant colors in fish and corals, bringing everything to life. The thin, low profile design coupled with sleek adjustable tank mount arm brackets will keep your focus firmly on whats inside your aquarium, providing a stylish lighting solution. Running virtually silent, two eFlux. Wave pumps produce pulsing waves or surging water currents while the eFlux. DC flow pump efficiently pumps water back into the aquarium from the filter sump. Custom Power Center keeps the power supplies, controller HUBs and all cables organized for a clean, professional install. A wireless remote provides complete control over your lights and wave pumps, keeping everything at your fingertips. Program lighting on/off times, daily weather forecasts, adjust wave pump flow rate & flow modes, and experience all on-demand features with a simple touch. Upgrade with our Bluetooth controller and use the LOOP APP to seamlessly connect via your mobile device. Each LOOP Marine bundle system includes an Orbit Marine IC PRO LED lighting system (including two Orbit IC LED fixtures), adjustable tank mount arm brackets, two controllable eFlux wave pumps, one controllable eFlux DC flow pump, with adjustable docking legs, DC UL approved power supplies, wireless LOOP IC lighting & wave pump controller, DC pump controller, mounting hardware and a power control center. Bundled kit includes lights, wave pumps & DC pumps, offering an incredible value. All controlled via programmable LOOP. Controller w/IR remote, upgradeable to Bluetooth. Component package includes everything, including a power control center and tank mount brackets for a professional, clean installation. Description: 48 LOOP Marine Bundle Orbit IC PRO LED light (two lights), adjustable tank mounts, two 1050 gph wave pumps, 1900 gph DC flow pump, power center. 2, 48 Orbit IC LED Lights. 2, eFlux Wave Pumps 1050 gph ea. 1, eFlux DC Flow Pump 1900 gph. Our primary warehouses are in PA, CA, SC, FL and AZ. Tracking information is provided with every order. Customers must allow an extra week of processing time for some items. Airfreight is the cheaper option but it's all up to you the customer. At The Coral Life we strive to do things different than the other outlets. We aim to keep things simple and only sell products we currently own or have used in the past. This is more than a business it is a passion. There's thousands of online stores, some who are cheaper, who simply try to sell anything and everything under the sun, with no care in the world of quality in the product or service. This does a few things for us. We know the products inside and out because, we use them in our reefs/tanks. We should be able to answer any question you have for us on a product. Setting up our store in this manner makes for a better overall experience for our customers. So if ever have a complaint please reach out to us before leaving feedback - as most can tell when they get a special treat with there packages ;- our service is customer minded. The item "CURRENT USA LOOP IC MARINE PRO BUNDLE WITH 48 ORBIT MARINE IC PRO LED LIGHT" is in sale since Thursday, August 31, 2017. This item is in the category "Pet Supplies\Fish & Aquariums\Pumps (Water)". The seller is "thecorallife" and is located in Mesa, Arizona. This item can be shipped to United States, Canada, Mexico.